We live our lives based on our beliefs and values. Most of the time, we learn life lessons by going through life-changing situations and activities. We understand that we were mistaken sometimes, and we learn that success does not come easy. We figure out that we must fight for what we want, and that progress and wealth comes to those who work themselves to death. We learn so many things throughout life! Every lesson is a new step towards our maturity and it’s a new experience towards our evolution. Our failures teach us how to fight better, and our victories give us a sense of accomplishment. Fortunately, we usually go through these experiences early in life, and we realize that we’ve changed a lot by the time we are forty. Anyhow, there are some significant life lessons that we learn later in life than we should. Want to take a look at them? Let’s see! Throughout life, we attain a myriad of knowledge on different topics. Whether it is about life, characters, or school subjects, we expand our horizons and see things differently. Unfortunately, learning new things is not enough. There are so many people who believe that they know everything about skydiving. They are passionate about it, understand it, and know exactly what the safety procedures are. They’ve learned these things from a Skydiver’s Manual. Now, the question is: do they know how it feels to jump? No, they don’t. They have an idea, they might imagine it, but until they don’t transform their knowledge into activity, they’ll never know what skydiving really is. Don’t wait for the perfect moment to take “the perfect action.” There is no such thing as a “perfect moment.” There is the present moment, which is the most important, and there is the future, which is something you work towards. If you wait for “the moment to come,” you are going to miss important things in your life. Enjoy living and seize the day! When we are young, we tend to see things differently. Everything is nice and pink – that’s when we have no adulthood worries. As time goes by, we realize that life is made of important challenges and risks that we need to take. “No risk, no fun,” someone once told me. And that’s true. As we mature, we start making important life decisions that are going to influence the rest of our lives. Your idea of success might not be my idea of success. Make sure you set your own goals and go for what you want, not for what people want you to go after. Even though most of the times we wish simple things, society influences us to wish something else. That is wrong, and that should be seen by more people nowadays. We tend to be ignorant to our wishes and ready to take on everything that this society offers us. Stop and look around: you’ll see what I mean! In order to have a great love life, work life, and family life, you must make efforts – and that is completely normal. You can’t expect to receive everything on a plate, ready to be taken. You must fight for your happiness, surround yourself with the right people, and take the right actions towards your emotional success. Make sure you know your limits and you set the right objectives. Sometimes, we think we can do more than what we actually can, and we end up disappointed with ourselves. Avoid that by giving up unrealistic expectations and setting achievable goals. If you don’t take any risks, you might never win. Of course, there is a chance of losing the race, but will you ever know whether that is true or not if you don’t try. People who are afraid of challenges end up frustrated and regret the actions they didn’t take for the rest of their lives. Be brave to take the right actions at the right time! Instead of constantly thinking how to expand your wealth and buy a new BMW, think about ways to keep yourself healthy. Let go of fast-food and unhealthy behaviors such as smoking. Start cooking healthy food and make time for yourself. If you feel stressed, meditate and take care of your own mind and body. 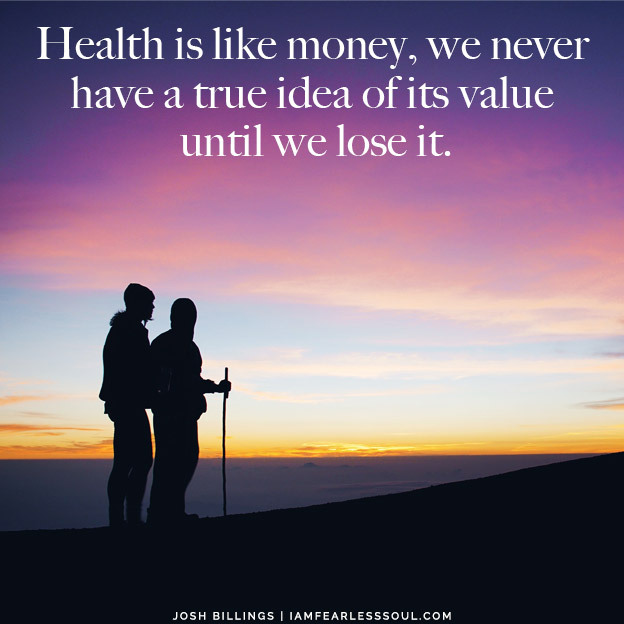 Without health, we have nothing. You can have all the money in the world! If you are not healthy, you will not be able to enjoy it. It’s the little things that matter. Make the best out of the time you have at hand. You never know when your life might end! Years go by quickly, and if you don’t do what you enjoy, you are going to end up miserable and unhappy. I am sure that it is not what you really want. Make sure you enjoy every second of your life. If you have a job that doesn’t make you happy, quit. If you study something you don’t like, change your major. Take the best decisions for you. Don’t try to change people! That is a big mistake and it’s going to make you unhappy. People who want to change themselves will seek for your help, and only then you can take action. Until then, understand that people have different point of views and life perspectives. You can’t change people, and you really don’t have to. The same refers to their efforts to change you unless you find it appropriate. In the course of life we should be able to optimize and adapt our goals to our needs and desires timely. There are a lot of people who say, “I wish I had that,” and they feel they would give it a try, but they never take any action towards achieving their goals. They don’t optimize their goals, they believe it’s not the right time, or that this is not what can really make a difference to their success at this particular moment. In fact, no one can’t succeed without making an effort or taking a shot! Make sure you set the right targets for you, and work towards conquering them to feel content with your life now. This is a lesson all of us learn later in life. Your actions and words have consequences! You can’t say something rude to somebody and expect them to be nice to you. That might happen from time to time, but it only happens rarely. Expect to get what you offer, so try to offer the best to all the people around you! My own experience has taught me that good things don’t come to those who wait. Good things come to those who make the best out of their lives and fight for what they desire. Make sure you take the best decisions for yourself, be aware of the people around you, and make the best out of your life. Good luck!